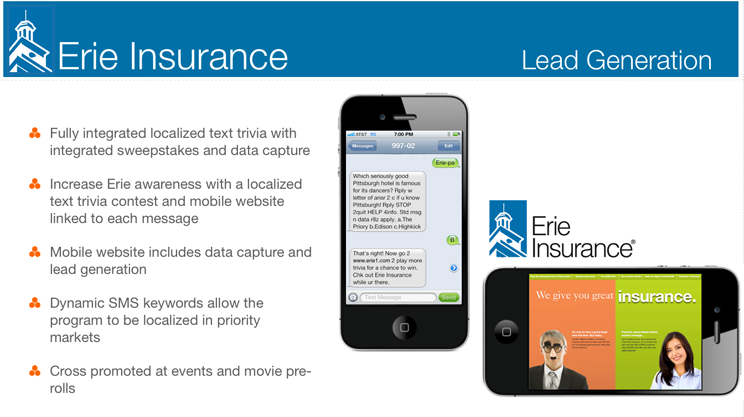 To increase awareness of Erie Insurance®, ApolloBravo developed this localized text trivia contest, fully integrated with a sweepstakes contest and data capture. A mobile website, which includes data capture and lead generation, is linked to each message. Using dynamic SMS keywords, the program can be localized in priority markets and is cross promoted at events and movie pre-rolls.